Location-based technologies and location services are widely used today for daily activities from social networking to finding a nearby restaurant or picking someone up from the airport. Knowing where their customers are located can help businesses identify where they need to provide service. As the smartphone user base grows, companies need to expand their audience through mobile apps. One problem is that not all developers ask for mobile permissions properly. "Too often apps ask for location consent on first open without explaining clearly what it will be used for," said mobile strategy adviser Steve Ricketts. This can hurt multiple businesses as users begin to turn down location permission prompts almost habitually. This year, Apple announced some significant changes in iOS 11 that can increase user opt-in; namely, iPhone users are granted more selections and transparency in giving away their location, thus reinforcing their confidence in location services. It used to be that when an iPhone app asks for a user's location, the user could only choose between "Always Allow" and "Don't Allow." In iOS 10, Apple offered developers an optional "Only While Using the App" permission selection, but most of the companies chose not to implement it. This was inconvenient, if not frustrating, when mobile users didn't always want to share their location but couldn't use the app otherwise. In its latest Operating System update, Apple removed it as an optional and make it mandatory to give users an "Only While Using the App" option, along with the usual yes and no. This is so users can choose to reveal their location only when they are using the app and not when it's running in the background. In addition to the new three-item permission menu, iOS 11 also added a blue status bar to alert users when a background application is using their location; the blue bar, like the green one that extends across an iPhone when users put their calls on hold, shows the name of the application accessing the user's location data. While this may be daunting for developers at first, it helps ensure that users share their information with full consent and knowledge of the value of location services; more specifically, that they gave their "Always Allow" consent with full understanding of its purpose. The added developer-to-user transparency can help companies improve their mobile permission opt-in rate and gain more customers in the long run. Further, Apple offers a user-friendly method for businesses to obtain a user's "Always Allow" permission. When users first use an app, they don't always understand why they need to share their location. In iOS 11, Apple offers a gradual, two-step approach for developers to obtain the "Always Allow" consent; instead of the aforementioned three-menu prompt, developers can now give new app users an "only while using the app" permission prompt first, followed by an "always allow" prompt some time later. Apple's intention behind its two-step approach is this: In the first prompt, businesses should state how the user will benefit from their location services; receiving exclusive deals or event notifications, for instance. 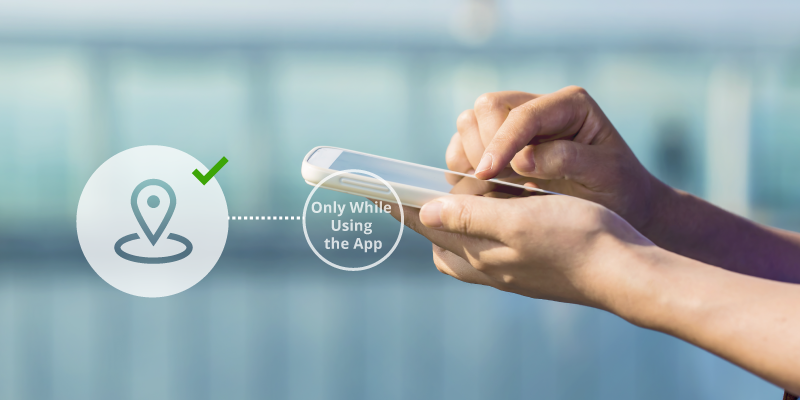 After the client has used the app for a while and confirmed its benefits, businesses can then show a subsequent prompt to obtain the user's "Always Allow" consent. Location-based services can help businesses increase sales, giving them valuable information about consumers in a given region. Whole Foods, for instance, uses location marketing tactics to prompt nearby mobile users with special discounts and incentives to visit its store. The result was a 4.69% post-click conversion rate -more passersby turning into shoppers. In short, the latest iOS update encourages developers to improve business-to-consumer interaction, putting mobile app users first so they will eventually opt for "Always Allow." We think that in order to continue providing users with location-based services as well as gathering location insights, businesses with mobile applications need to rethink and improve their approach when asking to the user location permissions. The main reason users don’t grant access to their location, is because they do not find value in allowing the application to know where they are. It’s important to alleviate users’ fears about their privacy with a good UX. Instead of just using the default location permission dialog box, mobile app owners can tell the user why they want permission for their location with a full description, as well as to ask the permission at the right moment. You can check out some best practices here. iOS 11 Beta is out for testing under Apple's beta software program so location-marketing businesses can start fine-tuning their current mobile apps before the operating system goes live this September.